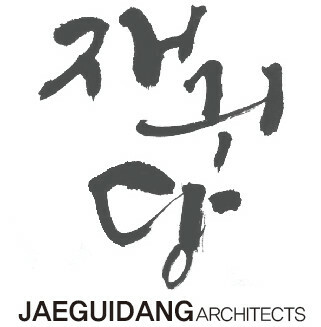 In the past few years, the drama of Korean culture has widened its stage. Television series, particularly those highlighting chefs, their cuisine, and their romantic endeavors, have become increasingly popular. As it has much to offer gastronomically, this culture also has a lot to give by way of creativity within living spaces. Below are 10 lovely homes that combine contemporary and minimalist influences. There is the use of natural materials, elegantly juxtaposed with Asian touches. A common feature is the presence of sunlight in key areas of the house. There are gardens, small open spaces, big windows, and glass sliding doors that allow natural light to enter. 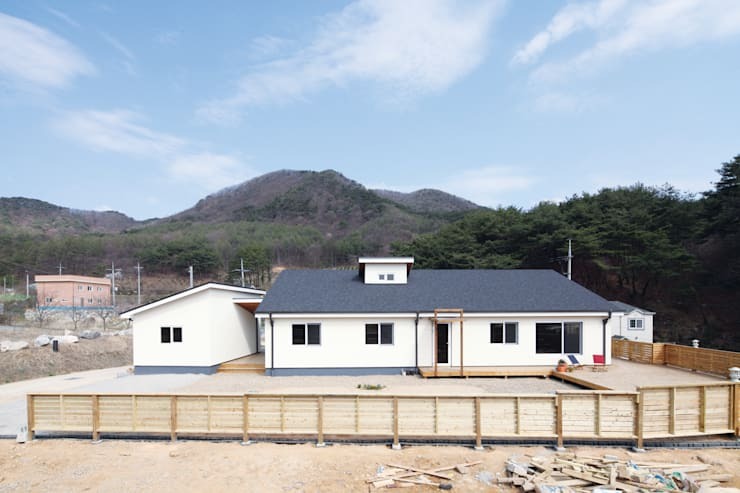 The simple architecture of this L-shaped home reflects a need for peace and relaxation. 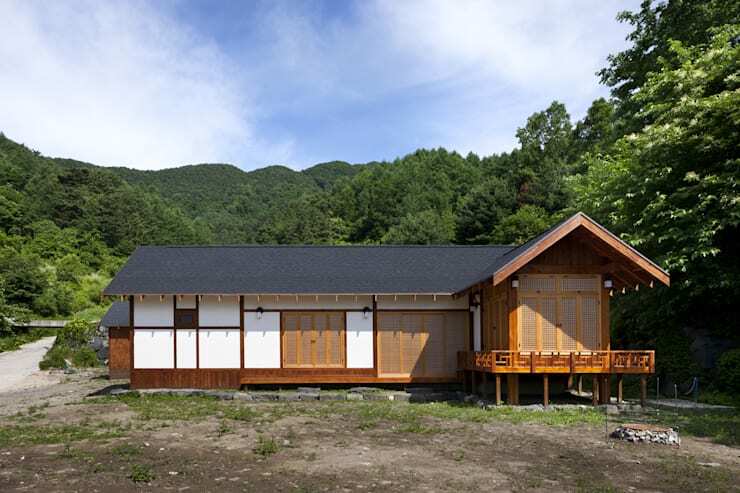 The design is often seen in areas by the Korean mountains, an oasis of tranquil respite. 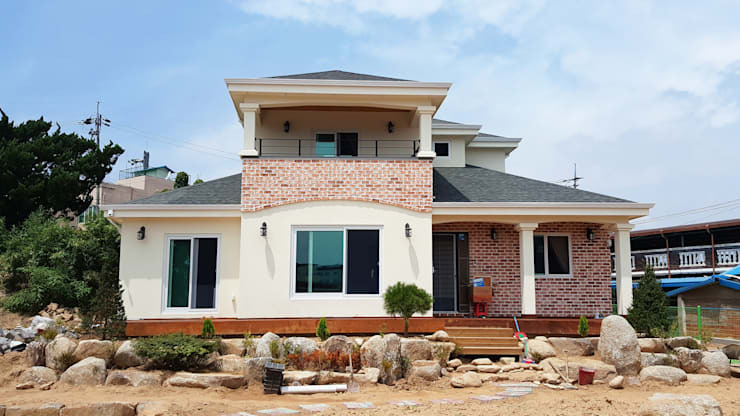 The classic look, created by the combination of a streamlined grey roof and white walls, is given an Asian flair through the use of antique wood for the doors and windows. From the slightly elevated section, wrapped by a wooden terrace, you are treated to a breathtaking view. Enjoy this sight particularly during early mornings and at dusk, when there is cross ventilation from all sides. 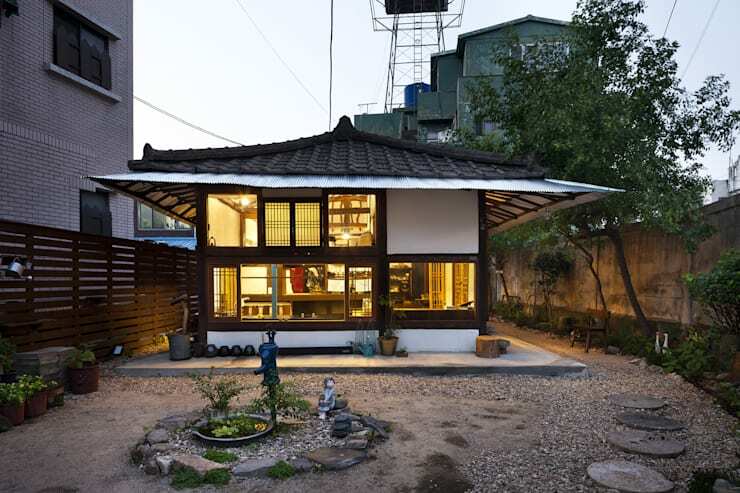 This type of home is a gem to Korean culture. It preserves the region's traditional architecture with the tiled Asian roof and the well-maintained wooden floors. The use of warm light and dark wood framing parts of the house gives a modern touch to a customary abode. 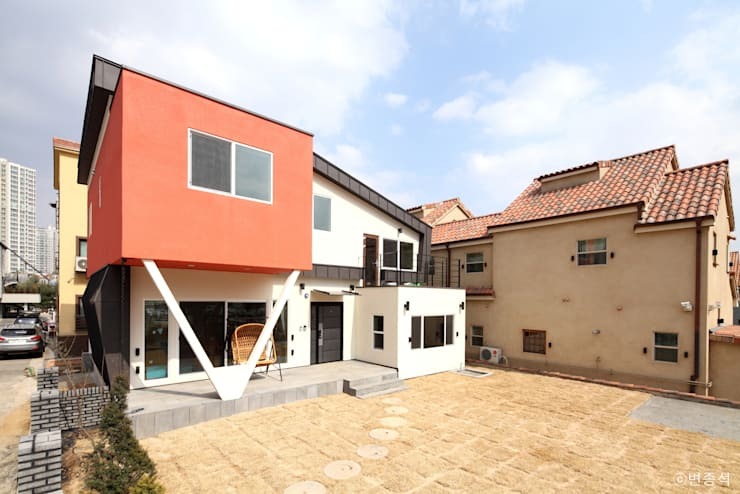 This type of modern home is very popular in Korea. It successfully utilises various elements and styles to create an aesthetic architectural wonder. The smooth texture and clean lines of wood remind us of city dwelling, while the roughness and uneven pattens of brick are reminiscent of farm houses. The almost unexpected fusion of both scenes comes together to build a favourite contemporary design. 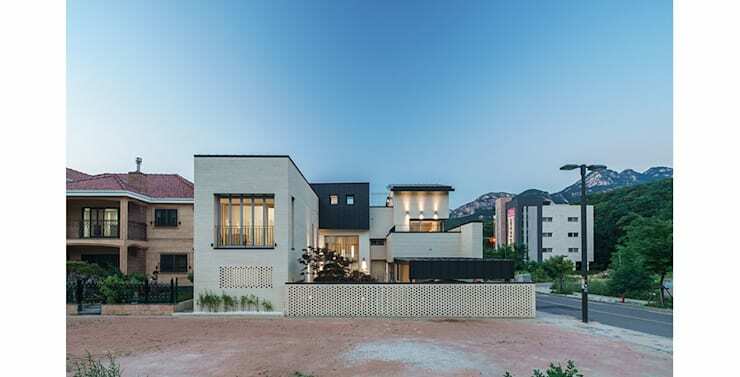 Architectural layering is evident in this two-storey home. There appears to be three houses stemming from one central point. We see a well-blended contrast, with the cozy terracotta tones between black and white minimalist structures. This picture could be a a Norman Rockwell work with slightly more modern and more Asian touches. The house is divided into many areas with the use of neutral tones tying it together. Predominant is the elegant combination of black and white, while beige and grey accents make for points of interest. The use of differently formed roofs create a distinctive architectural style. Imagine a row of houses with these edgy structures. What picture will they create from a distance or from above? This big house is perfect for big families. The artistic way areas are compartmentalised allow for privacy and individual indoor design. The use of eggshell paint makes the overall atmosphere bright, while the more minimal use of wood and brick projects an inviting atmosphere. 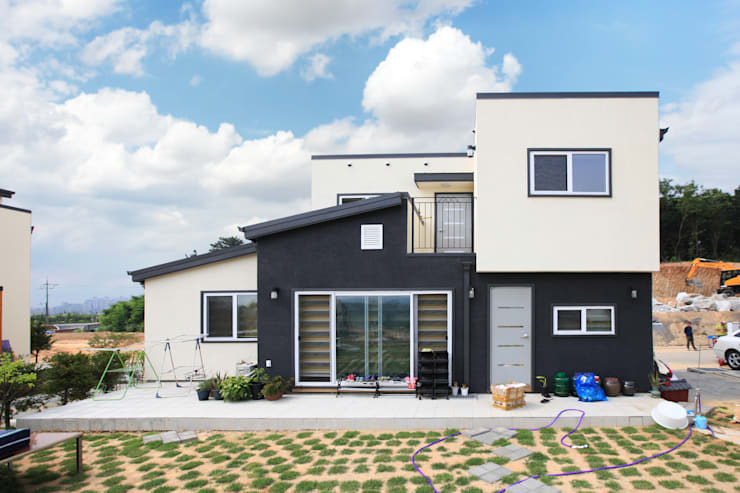 From a distance, this bungalow looks like a typical house outside the city. 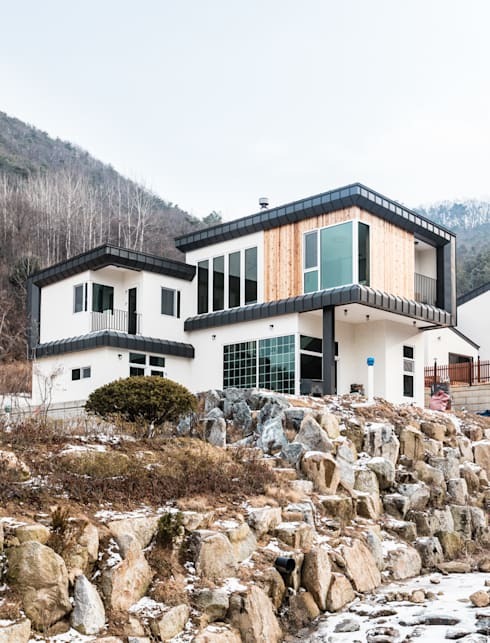 Unlike the usual roof in tones of red, brown or even green, this single-floor white house is topped by a grey-ish blue hue that gives a monochromatic feel to the landscape on a clear day. An added detail is the canopy that connects the house to a smaller structure, possibly an outhouse or a work station. An essential detail is that this structure is pre-fabricated. Materials are versatile. You may adapt or add design features to make it uniquely your own. 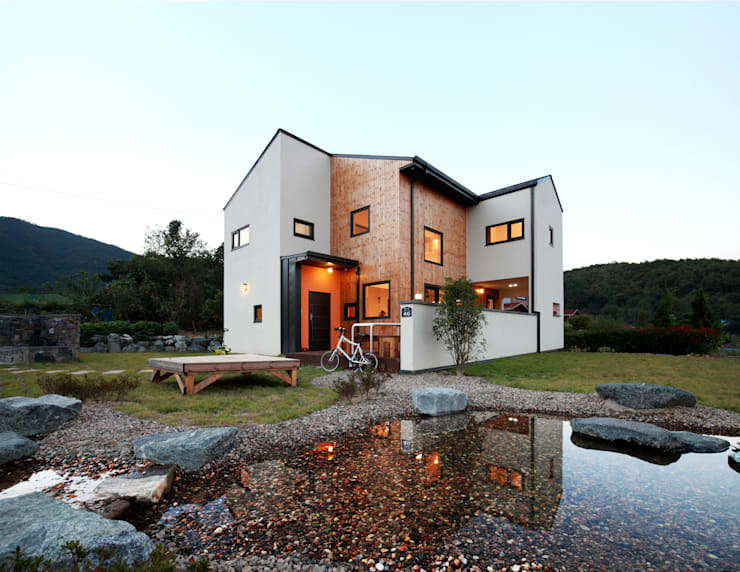 What could have been a simple two-storey home is given distinction by two things. There is the painting of a section in a different colour. We see this in the orange exteriors of a portion of the second floor. In addition, the V shaped pillars, on the ground floor, add an avant-garde touch that is sure to be a conversation piece. This is another house built for a big family. The entire structure shows lower abodes alternating with taller living spaces. This idea would fit extended families, particularly in Asia, whose members sometimes live together. The elegant and minimal contrast of eggshell and dark grey is made homier by warm light and touches of greenery. The interiors are decorated with natural wood, creating a more relaxed feel. 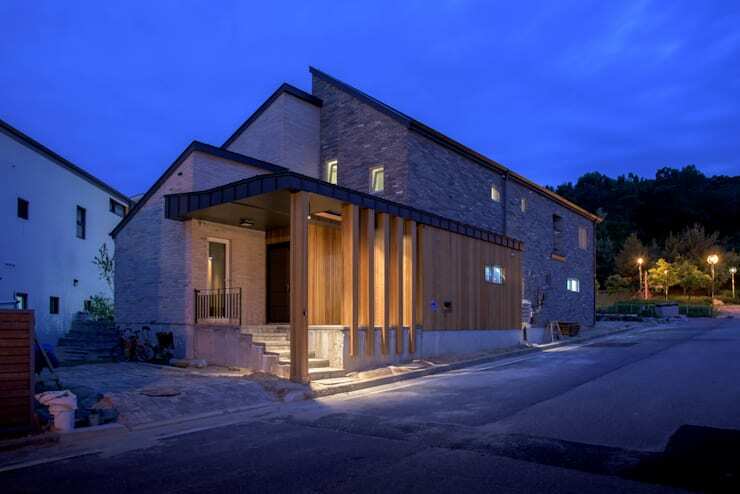 This house is suited for the hilly terrain and sometimes chilly weather of Korea. The fireplace has a long chimney that reaches the roof, guaranteeing the dwellers warmth at all times. Built on a hill, the aesthetic blend of white walls, natural wood and tinted glass makes for a stylized yet homely dwelling place.